It's simple. Affordable. Quick. Easy. What more can you want for a little Saturday afternoon project? This wreath is easy to switch up to reflect the new season too. Add some berries for a Winter wreath or wheat for a Fall inspired wreath. Just be sure to add "drying out friendly flowers" if you want to leave it up for a bit. Items like mini pine cones, berries, wheat grass, baby's breath, and other super hardy flowers, seeds, and berries that look the same for weeks out of water. You can also make this with magnolia leaves and add a couple magnolia flower buds for a long lasting wreath. Ugh, the possibilities are endless!!! You will want to knot your wire onto the wreath frame pretty tightly to secure. DO NOT cut the wire until the wreath is completely finished. You can now lay your greens where the wire is knotted onto the frame. Grab about three stems of olive and one stem of eucalyptus and spread them out so that they span across the frame and hide it. You can then begin to wrap the wire tightly around the stems and frame. Wrap around 3 times to secure. Continue to add greens and wrap the wire as you go without ever cutting the wire until you make it to the very end. Keep your greens pointing in the same direction. 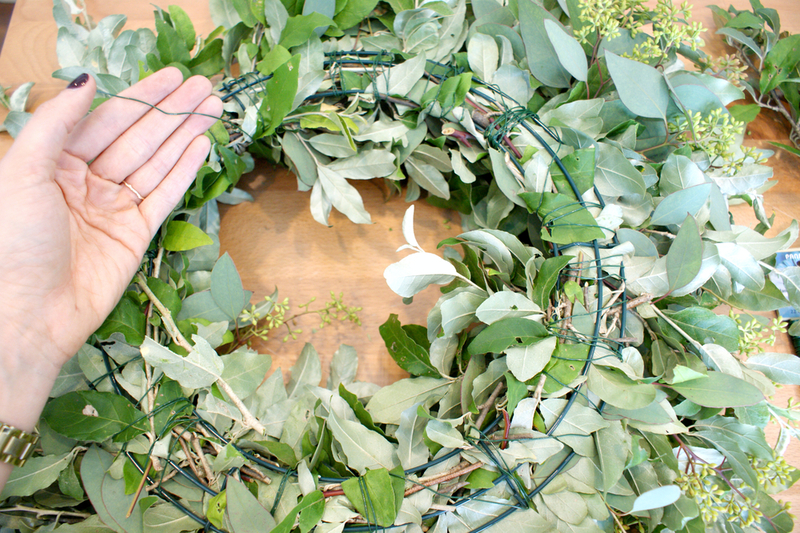 Once you reach the end, cut the wire leaving enough to knot it once again, tightly, to the wreath frame. Grab yourself a few sprigs of limonium and gently tuck them into wire going the same direction as the greens all the way around. Feel free to also add greens in the same way if certain parts of your wreath don't look as full as others. Cut yourself enough ribbon for as low as you want your wreath to hang while still being able to tie a bow. If you liked this then check out our DIY macrame tiered plant hanger tutorial!